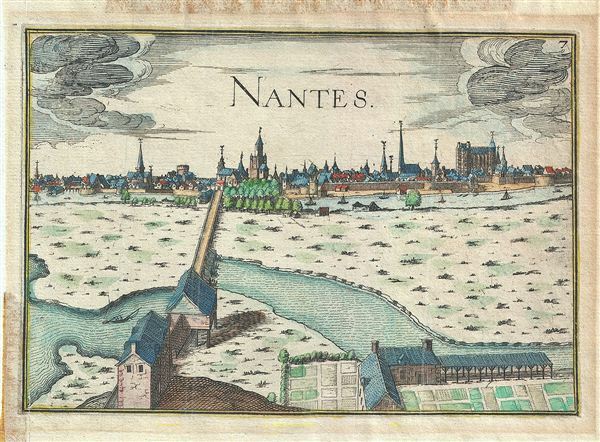 This is a rare 1634 Melchior Tavernier map or view of Nantes, France. It features a beautiful view of the capital city of the French department of Loire Inferieure, France (currently known as Loire-Atlantique). This area of France is part of the Loire Valley wine region, and is especially known for its production of Muscadet, a white wine produced from the Melon de Bourgogne grape variety. This area is also famous for a variety of cowÂ's milk cheese known as Fromage du CurÃ© Nantais. The Loire River is beautifully depicted here with a bridge spanning across the two branches of the Loire (Bras de la Madeleine and Bras de Pirmil). Several ships can be seen sailing in the river with cathedrals and churches in the distance. This view was published in Paris in 1634 by Melchior Tavernier as part of Plans Et Profils De Toutes Les Principales Villes Et Lieux Considerables de France.